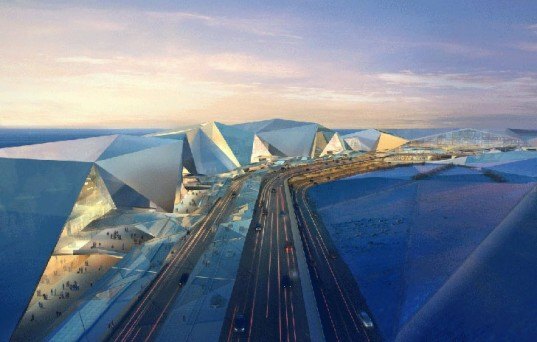 Appearing as a series of glaciers, HASSELL's design for the Harbin Taiping International Airport was spurred by the city’s candidacy to host the 2020 Winter Olympics. The glimmering peaks of the airport’s roof harmonize with the region’s landscape, which is known for its ice and snow. 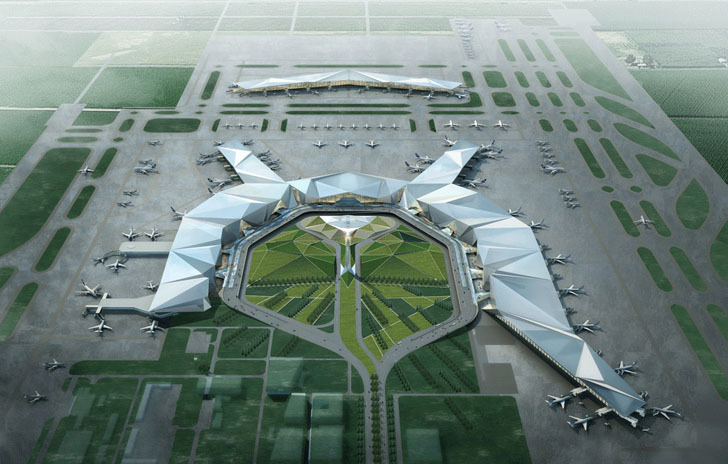 Hassell’s design was part of a competition to provide a new hub for 45 million passengers in North East China. Harbin is a city of 7 million located in the snowy north of China, and is known as an “ice city.” Drawing upon that, Hassell created a design that integrated within Harbin’s crystalline icescape, and took inspiration from the beautiful natural ice fractures that cover the nearby Songua River. Hassell designed a shimmering peaked roof building that stretches in a shape created by incorporating lucky Chinese numbers as references points, and feeding them into a 3D computerized matrix. The resulting building is a U-shape which evokes a snow capped mountain range. The folding peaked roofs are the lifeblood of the structure. They are used to protect parking areas from falling ice and snow. The translucent roof also creates a connection with the sun, filtering in sunlight which is precious in the northern region. The walls of the interior of the airport are floor to ceiling glass curtains, ensuring natural light throughout the interior during daylight. The roof also acts as a water and snow funnel, directing it into a collection system. Trace heating is used to prevent it from freezing, in order to protect the roof. The airport further blends into its natural surroundings thanks to indigenous black soil and local greenery which is placed in and around the site. Saltwater ponds, which freeze at a lower temperature, are also located around the building to help keep temperatures up. The sweeping airport would stylishly service the influx of passengers should Harbin win the bid for the 2020 Winter Olympics. Harbin is a city of 7 million, located in the snowy north of China, and is known as an “ice city.” Drawing upon that, Hassell created a design that integrated within Harbin’s crystalline icescape, and took inspiration from the beautiful natural ice fractures that cover the nearby Songua River. Hassell designed a shimmering peaked roof building that stretches in a shaped created by incorporating lucky Chinese numbers as references points, fed into a 3D computerized matrix. The resulting building is an U-shape which evokes a snow capped range. Hassell designed a shimmering peaked roof building that stretches in a shaped created by incorporating lucky Chinese numbers as references points, fed into a 3D computerized matrix. The resulting building is an U-shape which evokes a snow capped mountain range. The folding peaked roofs are the lifeblood of the structure. They are used to protect parking areas from falling ice and snow. The translucent roof also create a connection with the sun, filtering in sunlight which is precious in the northern region. The walls of the interior of the airport are floor to ceiling glass curtains, ensuring natural light throughout the interior during daylight. The roof also acts as a water and snow funnel, directing it into a collection system. Trace heating is used to prevent it from freezing, in order to protect the roof. The airport further blends into its natural surroundings thanks to indigenous black soil and local greenery which is placed in and around the site. Saltwater ponds, which freeze at a lower temperature, are located around the building to help keep temperatures up. The sweeping airport would stylishly service the influx of passengers, should Harbin win the bid for the 2020 Winter Olympics.